Most folks have probably heard of “Rosie the Riveter” the iconic image of women building bombers for America’s bomber pilots – (in fact she’s been adorning our website for nearly two years now). We all know that women did their part in WWII. That’s not new, but did you know that in Russia, during WWII, Soviet women were flying combat missions? Indeed, the brutal totality that was the Eastern Front during WWII demanded that everyone, men, women and even children were enlisted to fight against the Nazi invasion of the Soviet Union. 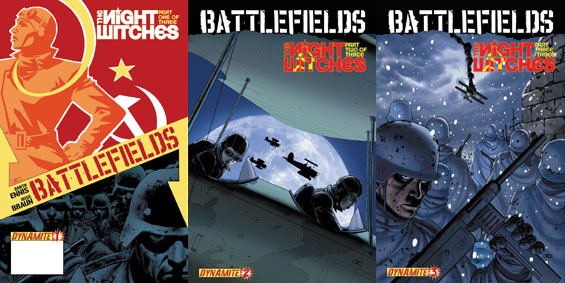 I first read about this in Battlefields: The Night Witches a comic by writer Garth Ennis and penciller Russ Braun. BBC Radio 4 recently aired a fascinating documentary on exploits of Russia’s WWII aviatrixes. It is currently available for online listening |HERE| – but, if that link isn’t valid by the time you read this post, fear not, you can also get it via torrent over on RadioArchive.cc. Lucy Ash tells the extraordinary but little-known tale of Russia’s three all-female regiments that flew more than 30,000 missions on the Eastern Front during Second World War. At home they were celebrated as Stalin’s Falcons, but terrified German troops called them the Night Witches. Lucy travels to Moscow and Rostov-on-Don to meet a number of these formidable women, who are now grandmothers in their 80s and 90s. She discovers that their bravery has inspired aerobatic champions, comic book artists and even a Dutch heavy metal band.